One Cat Picture Printer does one thing and it does it extremely well. One Cat Picture Printer prints pictures. Printing multiple pictures on the same page in standard picture sizes is a snap. Just locate your pictures, choose a layout, pick pictures from the thumbnail display, drag them to one of the pre-made templates, and print. 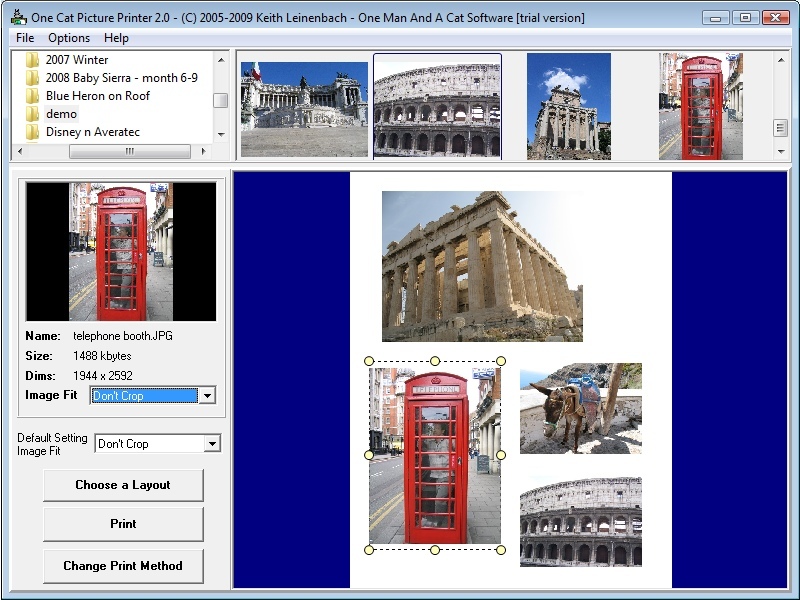 With version 2, you can also print entire directories at once, as well as print thumbnail catalogs. ...... Just locate your pictures, choose a layout, pick the ones you want from the thumbnail display, drag them to one of the pre-made templates and print. To make it easy to print a number of standard picture sizes on a page, One Cat Picture Printer gives you a number of pre-made layouts. You can also move and resize any of the pictures on the layout if you desire, so you aren't limited to the presets only. With version 2, you can also print entire directories at once, as well as print thumbnail catalogs. Qweas is providing links to One Cat Picture Printer 2.00 as a courtesy, and makes no representations regarding One Cat Picture Printer or any other applications or any information related thereto. Any questions, complaints or claims regarding this application One Cat Picture Printer 2.00 must be directed to the appropriate software vendor. You may click the publisher link of One Cat Picture Printer on the top of this page to get more details about the vendor.